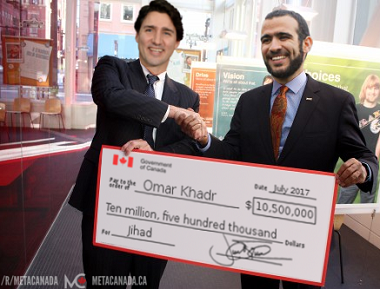 Was Omar Khadr A Child Soldier? Many terrorist sympathizers defend Omar Khadr by saying he was a child soldier, while emphasizing the word child and that his Charter rights were violated in Gitmo. Basically everything that happens to you in a war is a violation of your charter rights. What, are you going to yell at the enemy "Hey, you're violating my sec.7 Charter right to security of the person!" when he starts shooting at you? In war, the only universal right is the right to not be tortured. In order to qualify for the right to not be executed, you must either be a civilian, or a lawful combatant. You have to meet certain criteria to qualify as one of those categories. In order to qualify as a civilian, you have simply to not wear a uniform and not participate in military activities (including hostile acts) notwithstanding when you're under duress. For guerrillas like Khadr, in order to qualify as a lawful combatant (and thus be entitled to POW status when captured), you must wear a uniform when going about military activities (at the least, some symbol that's recognizable at a distance such as a coloured arm band or something), you must openly carry your arms, you must be part of a structured organization (not just some yahoo who decided to pick up a gun one day and start shooting at people), and you must obey the laws of war. If you don't satisfy those obligations, but you engage in military activities/hostile acts anyway, you don't qualify for combatant status, and are thus an "unlawful combatant". Unlawful combatants aren't entitled to the protections of a prisoner of war when captured, and the right to not be executed is one of those protections. So you forfeit the right to not be executed when you go about military activities without wearing a uniform or carrying arms openly (as Khadr did). It's the same logic by which spies can be executed in wartime. When you go about military activities disguised as a civilian, you put the civilian population at risk because you hinder your enemy's ability to distinguish between civilian and enemy. Going about military activities disguised as a civilian is an abuse of the good faith/safe passage that combatants are supposed to extend to civilians. The laws of armed conflict have no tolerance for this type behaviour. The right to not be executed is extended to civilians and fighters who obey the rules. You forfeit those rights when you act as Khadr did. That's why nobody knows what to do with these people. That's why the whole GITMO detainee, POWs or not, WTF are we supposed to do with these people question is such a conundrum. People who do what Khadr did are never supposed to return from theatre. In the past, they've always been put in front of a tribunal to determine their status, and then sent to a firing squad when it's concluded that they're not entitled to POW status. I might want to add, for the people that still want to refer to him as a child soldier... Canada was not at war with the United States when the United States captured him. He was fighting alongside al Qaeda. Al Qaeda did not have soldiers; it had terrorists. He did, however, claim to be Canadian again when he decided to sue Canada; his Canadian passport was convenient for that. And Trudeau seemed quite intent to settle.